OXFORD, Miss. 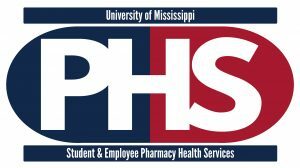 – The University of Mississippi’s Student Health Pharmacy has changed its name to Student and Employee Pharmacy Health Services and expanded its offerings to provide pharmacy services to employees. The renaming better reflects the scope of services and target population, said Chad Westmoreland, a pharmacist at the center. “Up until this year, our prescription services were limited to current Ole Miss students, but now we have expanded to provide services for university students, employees and employee families,” he said. Hours of operation are 7:30 a.m.-5 p.m. Mondays through Thursdays and 9 a.m.-5 p.m. Fridays. For more information, call 662-915-5279, visit https://healthcenter.olemiss.edu/pharmacy/ or email umpharmacy@olemiss.edu.